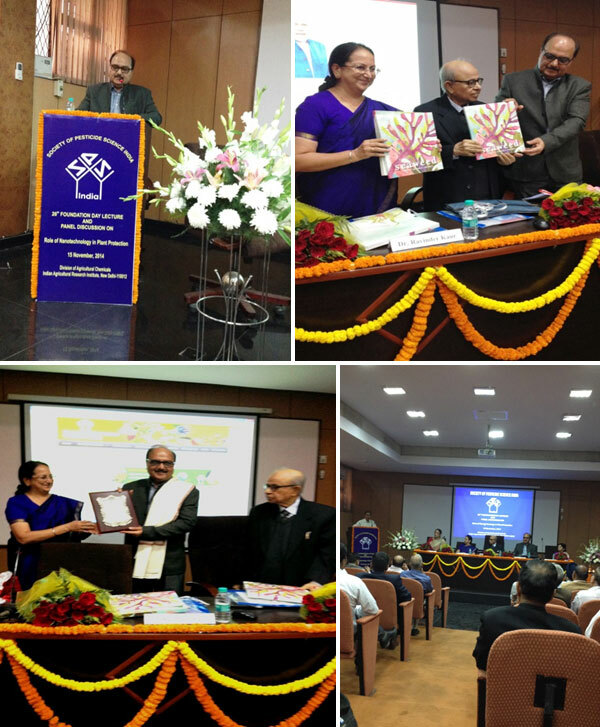 Group CEO, Mr. DK Chopra was invited by Society of Pesticide Science (SPS) Indian Institute of Agricultural Research (IARI) Pusa, New Delhi for its 26th Foundation Day lecture. On this occasion Mr. Chopra was honoured & felicitated for his outstanding contribution in the pesticide industry and was presented with a memento and shawl by Mrs Ravinder Kaur, Director IARI. Eminent Scientists and many industry colleagues were present to listen to his presentation on Realities and Challenges of Agrochemicals for Food security in India. On this occasion a Coffee Table Book on Sea Weed was also launched by renowned Scientist Dr Parmar and Dr Ravinder Kaur. Biostadt has taken the first of its kind initiative to bring out this Coffee table book which contains very comprehensive information on Seaweeds and its applications to create greater awareness amongst scientific community, Government authorities and various other stake holders.